You have to love the contrarian point of view, especially on cultural matters. There are plenty of contrarians on matters of domestic and foreign policy, and on social policy. Everyone writes about that stuff - illegal immigration is awful, or it isn't so awful, universal healthcare would be wonderful, or a socialist evil portending the end of the nation as we know it, the vice president's lesbian daughter really shouldn't be pregnant and her father happy about it, or that is a big whatever, we should stay in Iraq, we should leave, we should stay in a different way, or something. On his last day in office George Bush should bomb Iran back into the Stone Age and let the next president worry about the blow-back, or not. It's all on the table. Everyone has an opinion. But then there are the true contrarians, like Virginia Postrel, who, in the December issue of The Atlantic Monthly, offers this - In Praise of Chain Stores. Of course this hit the newsstands as most American hit the malls to buy Christmas presents, and found themselves staring at the jammed parking lot and the depressingly uniform stores beyond. The mall could be anywhere, they all look alike. The stores are the same. But she says these chain stores aren't destroying local flavor - they're actually providing variety and comfort. She has an odd view of comfort. Those of us who spent a decade or two as "cooperate road warriors" know this issue well. You fly back and forth across the country each week and there that sense of dislocation - is this London, Ontario, or Ontario, California? There's the Starbucks and the Gap. It could be Pittsburgh or Tucson. You never know - it's all a blur. You take a break, use the frequent flier miles, and take a vacation. You fly Paris and one afternoon need new jeans - and you find yourself in Gap on Rue des Rennes. Inside you might as well be in Tulsa (except the sizes have odd numbers). Next door, even Monoprix seems comfortingly familiar - except for the language. It has the feel of Albany or Denver. And Starbucks hit Paris two years ago. And every major airport certainly seems familiar - which is either comforting or surreal. They all look alike. This may or may not comfort you. At least it's easy to find the restrooms. "Every well-traveled cosmopolite knows that America is mind-numbingly monotonous - the most boring country to tour, because everywhere looks like everywhere else," as the columnist Thomas Friedman once told Charlie Rose. Boston has the same stores as Denver, which has the same stores as Charlotte or Seattle or Chicago. We live in a "Stepford world," says Rachel Dresbeck, the author of Insiders' Guide to Portland, Oregon. Even Boston's historic Faneuil Hall, she complains, is "dominated by the Gap, Anthropologie, Starbucks, and all the other usual suspects. Why go anywhere? Every place looks the same." Need proof? The array at Faneuil Hall can be examined here, although it should be noted that those of us who are pipe smokers can find a good selection of pipe tobacco at the newsstand near the southeast entrance. In any event, Postrel says what we have now is a variation on an old worry dating back to the twenties - the big guys are putting the Mom and Pop stores out of business. Today everyone knows the little small independents are doomed - and really mostly gone. That's probably most evident with the oddly charming, small, dusty bookstores - Border's and Barnes and Noble buried most everyone and they're long gone, except in period movies for a "cute meet." (A classic is Fred Astaire discovering Audrey Hepburn in that Greenwich Village bookstore in Funny Face, but that was 1957 and seems another world.) Given the small independents have been squeezed out, and that really is a given, the issue now is what's left - and it's just all the same, everywhere. Drive along Chandler's straight, flat boulevards, and you'll see Bed Bath & Beyond and Linens-n-Things; Barnes & Noble and Borders; PetSmart and Petco; Circuit City and Best Buy; Lowe's and Home Depot; CVS and Walgreens. Chandler has the Apple Store and Pottery Barn, the Gap and Ann Taylor, Banana Republic and DSW, and, of course, Target and Wal-Mart, Starbucks and McDonald's. For people allergic to brands, Chandler must be hell - even without the 110-degree days. Been there - she's right - the heat is brutal - and the place is just like any other once you walk into Target. One of the fastest-growing cities in the country, Chandler is definitely the kind of place urbanists have in mind as they intone, "When every place looks the same, there is no such thing as place anymore." Like so many towns in America, it has lost much of its historic character as a farming community. The annual Ostrich Festival still honors one traditional product, but these days Chandler raises more subdivisions and strip malls than ostrich plumes or cotton, another former staple. So there you have it, the place might as well be Altoona. No ostriches there either. Then comes the contrarian view - the stores don't really matter. National chains are not some blight on the landscape, and they've not turned American towns into an indistinguishable "geography of nowhere." The first thing you notice in Chandler is that, as a broad empirical claim, the cliché that "everywhere looks like everywhere else" is obvious nonsense. Chandler's land and air and foliage are peculiar to the desert Southwest. The people dress differently. Even the cookie-cutter housing developments, with their xeriscaping and washed-out desert palette, remind you where you are. Forget New England clapboard, Carolina columns, or yellow Texas brick. In the intense sun of Chandler, the red-tile roofs common in California turn a pale, pale pink. So, 1.) Stores don't give places their character, and 2.) Terrain and weather and culture do. The national chain stores, the claim is, just offer contrast. And in doing so they "make it easier to discern the real differences that define a place: the way, for instance, that people in Chandler come out to enjoy the summer twilight, when the sky glows purple and the dry air cools." That's a quite romantic notion. It's more likely not many of these "Zoners" are out enjoying the summer twilight - they're at Target buying this or that, or at home watching some comedy taped out here in Hollywood, on a set in Studio City that's supposed to be New York (think Seinfeld). A sense of place may be a mere indulgence, something for oddballs. Big cities could, and still can, support more retail niches than small towns. And in a less competitive national market, there was certainly more variation in business efficiency - in prices, service, and merchandise quality. But the range of retailing ideas in any given town was rarely that great. One deli or diner or lunch counter or cafeteria was pretty much like every other one. A hardware store was a hardware store, a pharmacy a pharmacy. Before it became a ubiquitous part of urban life, Starbucks was, in most American cities, a radically new idea. And there is economic reality - national chain stores bargain down prices from suppliers and divide fixed costs across a lot of units, a good thing, And the contention here us that they "rapidly spread economic discovery." That would be "the scarce and costly knowledge of what retail concepts and operational innovations actually work." That sure beats trial and error - "Expecting each town to independently invent every new business is a prescription for real monotony, at least for the locals." So scale is a good thing, or large-scale is. Chains make a large range of choices available in more places. They increase local variety, even as they reduce the differences from place to place. People who mostly stay put get to have experiences once available only to frequent travelers, and this loss of exclusivity is one reason why frequent travelers are the ones who complain. When Borders was a unique Ann Arbor institution, people in places like Chandler - or, for that matter, Philadelphia and Los Angeles - didn't have much in the way of bookstores. Back in 1986, when California Pizza Kitchen was an innovative local restaurant about to open its second location, food writers at the L.A. Daily News declared it "the kind of place every neighborhood should have." So what's wrong if the country has 158 neighborhood CPKs instead of one or two? The process of multiplication is particularly important for fast-growing towns like Chandler, where rollouts of established stores allow retail variety to expand as fast as the growing population can support new businesses. I heard the same refrain in Chandler that I've heard in similar boomburgs elsewhere, and for similar reasons. "It's got all the advantages of a small town, in terms of being friendly, but it's got all the things of a big town," says Scott Stephens, who moved from Manhattan Beach, California, in 1998 to work for Motorola. Chains let people in a city of 250,000 enjoy retail amenities once available only in a huge metropolitan center. At the same time, familiar establishments make it easier for people to make a home in a new place. When Nissan recently moved its headquarters from Southern California to Tennessee, an unusually high percentage of its Los Angeles–area employees accepted the transfer. "The fact that Starbucks are everywhere helps make moving a lot easier these days," a rueful Greg Whitney, vice president of business development for the Los Angeles County Economic Development Corporation, told the Los Angeles Times reporter John O'Dell. Orth Hedrick, a Nissan product manager, decided he could stay with the job he loved when he turned off the interstate near Nashville and realized, "You could really be Anywhere, U.S.A. There's a great big regional shopping mall, and most of the stores and restaurants are the same ones we see in California. Yet a few miles away you're in downtown, and there's lots of local color, too." But who cares about local color? The idea is to reduce anxiety. Local color is for tourists. And "contrary to the rhetoric of bored cosmopolites," most cities don't exist primarily to please tourists (exclude Paris and Hollywood of course). They're just places people live, and do their best to do well. So you're not supposed to scoff at "the children toddling through the Chandler mall hugging their soft Build-A-Bear animals" who are "no less delighted because kids can also build a bear in Memphis or St. Louis." They'll be fine. The contempt for chains represents a brand-obsessed view of place, as if store names were all that mattered to a city's character. For many critics, the name on the store really is all that matters. The planning consultant Robert Gibbs works with cities that want to revive their downtowns, and he also helps developers find space for retailers. To his frustration, he finds that many cities actually turn away national chains, preferring a moribund downtown that seems authentically local. But, he says, the same local activists who oppose chains "want specialty retail that sells exactly what the chains sell - the same price, the same fit, the same qualities, the same sizes, the same brands, even." You can show people pictures of a Pottery Barn with nothing but the name changed, he says, and they'll love the store. So downtown stores stay empty, or sell low-value tourist items like candles and kites, while the chains open on the edge of town. In the name of urbanism, officials and activists in cities like Ann Arbor and Fort Collins, Colorado, are driving business to the suburbs. "If people like shopping at the Banana Republic or the Gap, if that's your market - or Payless Shoes - why not?" says an exasperated Gibbs. "Why not sell the goods and services people want?" Fine. No oddly charming, small, dusty bookstores - except perhaps for "reconstructions" of what one might be like, for tourists. Embrace the homogenized surreal. Actually, you probably have no choice. And you can always skip the trip to the mall, turn off the television, and step out into the summer twilight, when the sky glows purple and the dry air cools. People will just think you're odd. They'll probably call the cops. When the political becomes overwhelming - things really are a mess here and around the world - you can always turn the television to the Food Channel, where no one talks about the war or George Bush or the latest madness in congress. There's no talk of whether, in an open democracy like ours, the government should tell that newspaper up in Manhattan that there are certain things they just shouldn't print, because a free press is responsible and doesn't print what the government says it shouldn't, or like the White House press secretary at the time of the 2001 attacks famously said, people should watch what they say these days, and not express the wrong opinions. Whatever. On television someone is explaining crab cakes. That'll do. Did the Israeli army just arrest the entire government of Palestine as part of the new massive invasion into Gaza to get back that one soldier who had been captured? Seems so, but then there are these things you can do with both basil and rosemary when preparing a chopped garlic crust for those lamb chops. That doesn't interest you? Scoot over to the Travel Channel and there's Samantha Brown providing one more tour of a fancy hotel you could never afford in a place you'd never go, or there will be one of those insider guides to Las Vegas - the real scoop on where the Rat Pack hung out in the early sixties or some such thing. But Frank and Sammy and the rest are all dead, and that town has changed. It's rather awful now, and the fake Paris in the desert is more than disorienting - it's existentially depressing, and deeply so. It's hard to explain, but imagine walking in off the street, where it's a hundred ten sun-blasted degrees, into a massively chilled casino, dark but with rank after rank of jangling slot machines being massaged by hopeful Asian grandmothers in their seventies, with fake Paris streets leading off from the edges, each with oddly exaggerated forced perspective, and a stylized painted blue sunshine sky twelve feet over your head. It's very odd - no Paris rain, no cigarette smoke anywhere (nor the diesel fumes you remember), and no one speaking French of course. Ah well, people love it. Everyone, now and then, needs to escape. You have to take a break from the heavy stuff. Some like the fake Paris. You could just go to McDonalds, of course, anywhere in the world - really. Well, you could, as Rolf Potts explains in Slumming the Golden Arches. That's where he suggests you'll find a completely culturally neutral place - a refuge. Although he doesn't mention it, what we have here is the contemporary equivalent of Hemingway's "clean, well-lighted place" - an odd safe harbor of sorts, a place that for a moment neutralizes the world and its woes. That's deep. But the place is so American. Or is it? European onlookers will tell you (with a slight sneer) that these peripatetic Yanks are simply seeking the dull, familiar comforts American culture. And this explanation might be devastatingly conclusive were it not for the fact that European McDonald's also happen to be crammed this time of year with travelers from Japan, Brazil, Israel, New Zealand, Argentina, Korea, Canada, India, Taiwan, Australia, Mexico, South Africa, and - yes - neighboring European countries. So what's up with that? They can't all be homesick for the McDonalds on McKnight Road in Pittsburgh or the one here in Hollywood at the base of Laurel Canyon on the Sunset Strip. That makes no sense. McDonald's has come to function as an ecumenical refuge for travelers of all stripes. This is not because McDonald's creates an American sense of place and culture, but because it creates a smoothly standardized absence of place and culture - a neutral environment that allows travelers to take a psychic time-out from the din of their real surroundings. This phenomenon is roundly international: I've witnessed Japanese taking this psychic breather in the McDonald's of Santiago de Chile; Chileans seeking refuge in the McDonald's of Venice; and Italians lolling blissfully in the McDonald's of Tokyo. So it's that Hemingway thing - life itself will drain you, and flatten you so you just cannot feel anymore. He finds his "clean, well-lighted place" in Paris or wherever, but now McDonalds have made such places available to everyone. Before I traveled overseas, I never knew McDonald's could serve as a postmodern sanctum, and - save for the occasional Taco Bell burrito - I rarely ate fast food. This all changed when I moved to Pusan, South Korea, ten years ago to teach English. Overwhelmed by the onslaught of new sights, sounds and smells my first week in-country, I retreated to a McDonald's near my school, where I was able to stretch a Big Mac Meal into three hours of Zen-like oblivion. The appeal of this environment came not from the telltale icons of franchise culture (which I'd always found annoying), but in the simple opportunity to put the over-stimulation of urban Korea on pause. Once I ended my Pusan stint and started traveling across Asia, I retained this habit of occasionally seeking out McDonald's in times of mental exhaustion. McDonalds "as a postmodern sanctum" for a Zen-like step outside the karma is a new one, but it does make some sense. When you're there you truly are nowhere, in so many ways. And he says he'd "wager that the contempt sophisticated travelers hold for McDonald's has less to do with ethical principle than the fact that fast-food franchises ruin the fantasies of otherness that are an inherent part of travel. The aesthetic enjoyment of the Taj Mahal or the Jardin des Tuileries can feel compromised when the Golden Arches are just a few blocks away." Yes, in the midst of the culturally specific, and intimidating and hyper-famous (you read all about these places in school, and were told they were significant in ways you, being a provincial hick, probably never fully understand), the meaninglessly general just down the street is unsettling. It's not exactly the jolt of carefully reading "Being and Nothingness" - but it will do. It's the real life Cliff Notes version. In India, for example, a McDonald's serves chicken "Maharaja Macs" instead of Big Macs (due to Hindu and Muslim taboos against beef and pork), and a door-greeter is often available to assist the middle-class clientele. Moreover, as any Pulp Fiction fan will note, Paris McDonald's offer the option of ordering a frothy beer with le Big Mac. At times, an international McDonald's franchise can serve as a kind of measuring stick for cultural nuance. In China, where familial identity is a core virtue (and where a sexually ambiguous bachelor-clown mascot might seem a little weird), Ronald McDonald is known as Uncle McDonald, and he has a wife, Aunt McDonald. In parts of Bangkok, where the laid-back Thai concept of sanuk (lightheartedness) threatens fast-food efficiency, McDonald's staff members use James Bond-style digital countdown clocks to ensure the food arrives in a timely manner. In Cairo, I witnessed young, middle-class Muslim couples going on chaperoned first-dates in a McDonald's; in Tel Aviv, the teenage staff got so flustered when I ordered non-kosher cheese on my Big Mac that they forgot to add the beef patties. But these are minor frills and flourishes, as the core of the experience is that when you're at McDonald you're really nowhere, or everywhere. It's very Zen. ... it can be interesting to learn how the simplest experiences overseas can affect the way you see things when you come home. I recall how, after returning from my first year in Korea, the understated calm of a Great Plains Christmas left me with a severe case of reverse culture shock. My solution? I headed over to the west 13th Street McDonald's in Wichita, where my sense of place melted away the moment I walked through the front door. Indeed, as I ate that Kansas Big Mac Meal, I may have as well have been back in Asia. Ah yes, nowhere and everywhere. Bliss. Satori, and all that. But if you think this sort of discussion of the philosophical and cultural implications of what McDonalds has created in this word - "a postmodern sanctum" for a Zen-like step outside the karma of the everydayness of this life and its world of illusions - is reading a bit too much into grabbing a Big Mac with cheese and a side of fries, then you will be flummoxed by Thus Ate Zarathustra, Woody Allen's new piece in the latest New Yorker. Who would have thought that "Friedrich Nietzsche's Diet Book" existed? Fat itself is a substance or essence of a substance or mode of that essence. The big problem sets in when it accumulates on your hips. Among the pre-Socratics, it was Zeno who held that weight was an illusion and that no matter how much a man ate he would always be only half as fat as the man who never does push-ups. The quest for an ideal body obsessed the Athenians, and in a lost play by Aeschylus Clytemnestra breaks her vow never to snack between meals and tears out her eyes when she realizes she no longer fits into her bathing suit. It took the mind of Aristotle to put the weight problem in scientific terms, and in an early fragment of the Ethics he states that the circumference of any man is equal to his girth multiplied by pi. This sufficed until the Middle Ages, when Aquinas translated a number of menus into Latin and the first really good oyster bars opened. Dining out was still frowned upon by the Church, and valet parking was a venal sin. As we know, for centuries Rome regarded the Open Hot Turkey Sandwich as the height of licentiousness; many sandwiches were forced to stay closed and only reopened after the Reformation. Fourteenth-century religious paintings first depicted scenes of damnation in which the overweight wandered Hell, condemned to salads and yogurt. The Spaniards were particularly cruel, and during the Inquisition a man could be put to death for stuffing an avocado with crabmeat. No philosopher came close to solving the problem of guilt and weight until Descartes divided mind and body in two, so that the body could gorge itself while the mind thought, Who cares, it's not me. The great question of philosophy remains: If life is meaningless, what can be done about alphabet soup? It was Leibniz who first said that fat consisted of monads. Leibniz dieted and exercised but never did get rid of his monads - at least, not the ones that adhered to his thighs. Spinoza, on the other hand, dined sparingly because he believed that God existed in everything and it's intimidating to wolf down a knish if you think you're ladling mustard onto the First Cause of All Things. This is a meal for the Superman. Let those who are riddled with angst over high triglycerides and trans fats eat to please their pastor or nutritionist, but the Superman knows that marbleized meat and creamy cheeses with rich desserts and, oh, yes, lots of fried stuff is what Dionysus would eat - if it weren't for his reflux problem. Yeah, whatever. Allen can be tiresome. But he does offer this "found" aphorism - "Epistemology renders dieting moot. If nothing exists except in my mind, not only can I order anything; the service will be impeccable." So it's off to McDonalds now. It's nowhere, and everywhere, and down on the corner - Sunset and Laurel Canyon. The Zen Buddhist experience commonly recognizes enlightenment as a transitory thing in life, almost synonymous with the English term epiphany, and satori is the realization of a state of epiphanic enlightenment. Because all things are transitory according to Zen philosophy, however, the transitory nature of satori is not regarded as limiting in the way that a transitory epiphany would be in Western understandings of enlightenment. The transitory nature of satori, as opposed to the more enduring Nirvana that is sought in the Buddhist traditions of India, owes much to Taoist influences on Chén Buddhism in China, from which Zen Buddhism of Japan evolved. Taoism is a mystical philosophy that emphasizes the purity of the moment, whereas the Hindu roots of Indian Buddhism lend a longer view toward escaping the Karmic prison of perpetual reincarnation in the material world. Oh. You want fries with that? Who says all pop culture trends start out here in Hollywood? You've heard it all. Los Angeles, the City of Angels, offers something for everyone. Trends start here - some say so does the future. Hollywood creates trends. It determines what is cool. It's the world's cultural capital in some odd way, if the only culture left is large-scale shallow but flashy movies for the world market, popular music of all sorts, and what passes for fashion among fifteen-year-old girls, and celebrity detached from anything like achievement or expertise in anything but posing. And there's television - we gave the world the sit-com, games shows and The Simpsons and all the rest. One needs to remember that Hollywood is a recent invention, incorporated as a municipality in 1903, with town ordinances prohibiting the sale of liquor except by pharmacists and one outlawing driving cattle through the streets in herds of more than two hundred. In 1904 we got the trolley - Los Angeles to Hollywood up Prospect Avenue. In 1910 Hollywood was annexed into the City of Los Angeles - we needed that water the new Los Angeles Aqueduct was piping down from the Owens Valley. Prospect Avenue was renamed Hollywood Boulevard. The movie industry boomed. Expatriates from Europe showed up in the thirties - Stravinsky, Schonberg, Man Ray - and Faulkner and F. Scott Fitzgerald were writing screenplays, and drinking heavily at Musso and Franks. See this from February 4, 1905 in the Los Angeles Daily Times - "Business of an objectionable character has been discouraged; the saloon and its kindred evils are unknown." Times changed. Hollywood became the center of a certain sort of everything. And we came to know all the kindred evils, every one of them. We turned them into entertainment for the world. But sometimes trends start elsewhere, and then out here in Hollywood we play catch-up, turning obscure French films into Hollywood blockbusters, and turning the Beatles into the far less odd Monkees. Now it seems to be happening again. If you're in Paris you can switch from watching The Simpsons in German on Arte to watching Star Academy on TF1, the French take on American Idol. Drop by the local tabac and buy a pack of the most popular chewing gum there, Hollywood. Buy cheap jewelry at Sunset Boulevard on rue des Rennes. But know things sometimes run in the other direction. Earlier this year, NBC announced that it had acquired the rights to develop and screen a US version of the Eurovision Song Contest - instead of forty European nations competing in a cheesy big-budget show for the best bouncy pop song, each of the fifty states of the union will do that. You call in on your touch-tone phone and vote for the winner. Of course you can hardly wait for that. It may seem peculiar, but the NBC people are no fools. The Eurovision Song Contest is now it its fifty-first year, and draws three hundred million viewers each year. So it didn't start in Hollywood. So what? This could be the next big thing on American television, if you hide the origin. Who remembers "All in the Family" was a version of a UK show, and Archie Bunker had his East End prototype? We're talking big bucks, smash hit potential, with a fine buzz. Will it work here? Maybe, but this Eurovision Song Contest is very odd, and has come up before here - June 8, 2003, here - "watching the Eurovision Song Contest will either put you in a coma or drive you mad." Does anyone on this side of the pond follow the Eurovision song contest? I doubt it. This contest predates American Idol by many, many years, but like American Idol showcases some awful pop music. All the countries of Europe enter a singer or a group doing an original song - and from this event we were all introduced to Icelandic pop rock. Swedish stuff? Think of ABBA without wit or talent. You get the idea. Perhaps the only thing good that ever came out of the Eurovision song contest was by accident - many years ago an Irish folk dance group performed between contestants and became wildly popular, that was Riverdance and then Michael Flaherty proclaiming himself "Lord of the Dance" and stomping around. Whether this was a good thing depends on your appetite for penny whistles and fast unison clogging by rank upon rank of thin redheaded beauties. The rest of the item covered that year's contest held in Istanbul. Ukraine won - only the second time the country had taken part in the competition - Ruslana won for her song Wild Dance. Serbia and Montenegro were second, with Greece third. The Sydney Morning Herald quoted one die-hard fan who acknowledged that the contest - with its flamboyant costumes and high camp quotient has "seen better days." Noting that Eurovision enjoys a large gay following, he added, "It's like a gay world cup. Who else would sit here and watch this load of rubbish?" The next year was covered here, May 29, 2005 - Greece is the Word. Greek singer Helena won. Ukrainian President Viktor Yushchenko presented her with the prize for her performance of My Number One, "a mid-tempo tune with minor-keyed Balkan flavorings." The surprise runner-up was Malta's Chiara. Romania's Luminita Anghel placed third. Vanilla Ninja, from Estonia but representing Switzerland, and Bosnia-Herzegovina's Feminem, with one of its three singers born in what is now Croatia, didn't do that well. So it was Greece, then Malta, then Romania. Cool. Obviously the country for the previous winner hosts the contest the following year. That means the contest this year is in Athens, with the semifinal May 18 and the final on May 20, and you can read all about it at the official website here. Nonsense lyrics, frenetic dance routines, and costumes that sprout pterodactyl wings. Whose Three-Minute Pop Ditty Will Rule the Continent? The issue? The Eurovision Song Contest "can stake a legitimate claim to being the world's most watched regular music event. Despite this, the show remains entirely unknown to all but a handful of Americans." In theory, Eurovision's aim has always been to discover "the best song in Europe," with the focus on "song." In practice, things don't quite work out so simply. Since the majority of the viewing public will only hear the competing songs once before casting their telephone votes, it is imperative that each performance creates an instant impact to ensure that it stands out from the herd. So, every trick in the showbiz book is thrown out, in rapid and dizzying succession. Dance routines start from a base level of "frenetic" and escalate upward. (This year, there's an awful lot of break dancing.) Costumes start at "florid" and expand outward - in many cases, quite literally. (The gown worn by the Swedish contestant covers most of the stage space behind her, and the monster costume worn by Finland's lead singer sprouts outsized pterodactyl wings during the final verse.) Mid-song costume changes are not unheard of; mid-song costume removal has become almost common, ever since a 1981 British victory in which the male performers tore off the skirts of the female performers, to a lyrical cue of "And if you wanna see some more!" Okay. Think about what each of the fifty states over here could do on the NBC version. Pennsylvania with molten steel and a remix techno-thump version of the Pennsylvania Polka? What will North Dakota do? Delaware? Oregon? It's hard to see how this will work. America has been homogenized in a way Europe has not. It not only that we all speak the same language (more or less), we all lead pretty much identical everyday lives - every mall has its GAP, Restoration Hardware and food court with the usual suspects, and Boston and Tucson and Billings look alike where one runs one's errands and relaxes. NBC may have misjudged this one. Due to a restriction dating from the show's genesis in the 1950s, when pop music was obliged to fit the strictures of the 7-inch vinyl format, no song is permitted to exceed three minutes in length. This ensures a tight discipline in their construction, into which a variety of well-worn tricks are squeezed. Each song must grab the listener's attention within the first few seconds, and each song should build to a suitably exhilarating conclusion - usually by means of an upward key change before the final refrain. When it comes to that all-important chorus - which is reprised in a memory-jogging video montage just before the telephone lines open - the melodic hook should ideally be underpinned by a short, memorable phrase, using lyrics that are simple enough for the international, multilingual audience to grasp. In this respect, nonsense language can be a great boon: Previous winning songs have included "La La La," "Boom Bang a Bang," "Ding Ding-a-Dong," and the splendidly dumb "Diggi Loo Diggi Ley." Well, we don't have much of a multilingual audience, so the lyrics here may be better, and the three minute rule can be waived, although it could be useful to limit viewer pain from overload. Too much screeching spectacle and the audience switches over to CSI, just for relief. As for NBC moving forward, Atkinson notes "there is nothing remotely hip about Eurovision, which generally runs at least ten years behind developments in youth-based genres, if not twenty." Hardly any rap and metal - no modern R&B. But then, "this stylistic conservatism does ensure a continuing appeal to the sort of traditional, multigenerational, family-based demographic that is rapidly disappearing in our tightly segmented multichannel age." Yeah, but will it play in Peoria? NBC has a problem. The whole thing is not remotely hip, nor does it seem to hit that sweet spot for middle America - safely hip in a non-threatening way that still lets the viewer feel "with it." That's an old Hollywood trick. What you give the rubes has to be as daring and controversial as the hot movie of the moment, "The Da Vinci Code" - not very. Think of "Rebel Without a Cause" - in the mid-fifties every fifteen-year-old guy in Ames or Buffalo was really James Dean, going though existential angst. Right. Make people think they're thinking, and let them think they're in on the cool. It sells. Yes, the Eurovision Song Contest is flagrantly camp - that overused and much devalued term - but like all the best camp, it retains a certain innocence and sincerity at its core. So, when the 10th dolled-up pop moppet in a row gushes at her press conference about what a deep and humbling honor it is to be representing her country, and our eyes roll upward in exasperation, we also know that, deep down inside, she actually means it. And I, for one, like that a lot. Okay, camp just won't do. That's charming for forty seconds, then it's cloying. Americans will shrug and move on. NBC has to sell the innocence and sincerity thing. People eat that up. And as they say out here in Hollywood, if you can fake sincerity you've got it made. You might want to browse the 2006 Eurovision Song Contest entrants here. The Finnish entry, Lordi is conventionally strange - AC/DC meets the Orcs (or Klingons) - and check out Germany's Texas Lightning in their cowboy outfits. Camp indeed. Will "Our Man in Paris," Ric Erickson, editor of MetropoleParis, be watching? Starts Saturday at 21:00 on France-3 TV. What else is on? A variety show on TF1, the 43rd rerun of 'Jean Moulin' on France-2, oooh there's '1631, Massacre à Magdebourg' on Arte - something about Europe's eternal wars of religion I guess - and there's 'Smallville' on M6. Canal+ I don't pay for so forget it. Being in sort of a transmission shadow - I can't quite see the Tour Eiffel - my TV comes from an antique roof antenna, and then an antenna cable running through the apartment. Arte, luckily for me, gets the best reception. TFI and France-2 are about equal, France-3 is not so good and M6 sticks to black, white and snow. But I can use the tuner in the video recorder; it's better than the TV's. The observation that the Eurovision can be very camp is true. For three hours the only jokes will be in the dulled minds of the viewers because no jokes are allowed on stage. It's a long time to go watching a band of nitwits trying not to offend anybody, from Palestine to the North Pole. In a word, it's Europe. Last night for example, on Arte of course, there was a documentary about how the Nazis treated homosexuals - with four of the six remaining survivors telling us how it was. in parts It was pretty emotional. At the time, in the 20s and 30s, a lot of people thought the Nazis were a gang of 'schwülen.' There was Röhm for example, head of the SA. Anyhow, not-so-fond memories of stays in Dachau and other Nazi spas. 'Jean Moulin,' mentioned above, was a resistance hero in France, bounced by the Gestapo in Lyon and killed. There's a museum here named after him. Against a background like this the Eurovision Song Contest better not have any jokes. And that's the word from Paris. One of my friends, a doctor of some repute, an internist, has parents who retired to Las Vegas, Nevada. The place has always fascinated me, from my first trip there with a Chinese-Vietnamese woman I was dating, and her family, and her brother who was participating in the Women's Wear Daily trade show with his line of silk t-shirts. Ah, Vietnamese fish-ball soup in an obscure casino restaurant, chatting with the grandmother, in broken English, about Buddhism, while the slot-machines rattled away in the distance. Not to be missed. And the trade show was a trip. Later, a software convention or two, drinking scotch in the jazz bar at Paris Las Vegas, chatting with the bartender from Minneapolis. 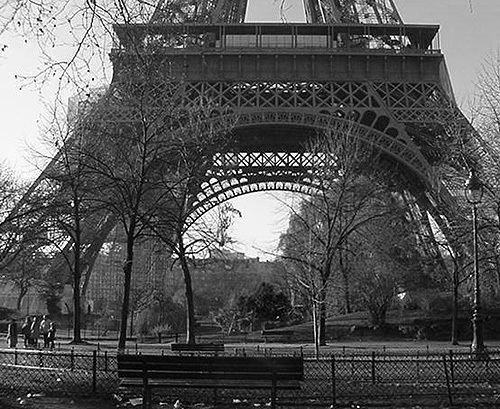 The half-size Eiffel Tower - welded aluminum, not riveted cast iron - had one of its feet near the small stage, where the fifth-rate jazz combo was launching into "Fly Me to the Moon." Frank Sinatra has been dead for years. Las Vegas is impervious to jokes, because it already is one. Vegas is mockery-proof. The strip is so over the top, so jubilantly, unashamedly fake (even the rocks are artificial), so ebulliently and confessedly crass, so contented with or even proud of its own trashiness that you can't make fun of the place. How can you deride a wooden Trojan horse two storeys high that doubles as an FAO Schwarz toy store? It is pre-ridiculous. This frustrates the likes of myself no end, because pejoratives like "tacky", "tasteless", and "garish" ping off a giant gold-painted sphinx like pennies off a curb. Because one cannot parody parody and I do not gamble, I had nothing to do. So it was inevitable that on a second swing through I'd no longer be able to find Las Vegas a zany, kooky, harmless American one-off, but would disparage it as a ghastly monument to American vapidity. Folks in the richest country in the world do not know what to do with their money in their leisure time save try to scrounge more of it, and do not truly embrace their own supposed work ethic. Indeed, given that many of my countrymen's concept of entertainment is heading for a line of casinos whose decor is so loud it makes your eyes hurt, whose patterned carpet and even air freshener has been carefully researched as encouraging you to lose your shirt, I am not convinced that most of the gamblers I spied on last week would have any idea on what to spend their winnings even if they improbably hit the jackpot. All money is not created equal. It means something different depending on what you did to get it. Surely earning money - earning it - is an underrated joy. I find being paid for my labours ceaselessly gratifying, and the harder I've worked for any given cheque, the more sumptuous the texture of the paper. By contrast, how satisfying is dosh that you came by not because you were smart or talented or diligent, but lucky? If this seems hopelessly humourless about a town that intends to be a laugh, the amount of cash involved is serious. The bar at Wynne's, the newest and most lavish casino on the block, boasts of a $75 martini, and you sense its designers grew frustrated at running out of nooks into which to cram polished Italian marble. My father-in-law tells me that when his car got dusty last week he came upon a woman playing a slot machine who was going through $400 a minute. That was $24,000 an hour, at a car wash. I do admire the nerve and devil-may-care required to put thousands on the stumble of a roulette ball. I concede that if you're canny enough to follow a few simple rules in blackjack - always double aces and eights, always double-down on an 11, don't take a hit if you're holding 12 or more and the dealer is showing a five or six - you can walk away with a few bills left in your wallet. But a quick look round a casino and you start to wonder, who pays all these croupiers and cleaners, who ultimately finances the orchids in every room? Losers. More losers than winners by a yard, and that rational calculation, aside from sheer wimpiness, explains why I don't gamble. By the way, the Frenchwoman who lives a few blocks away, just below Sunset Plaza west of here, loves Las Vegas, and the faux Paris. She became an American citizen a few years ago. And every chance I get, I fly back to Paris to walk in the rain smoking my pipe. Reuters reported from London on Friday, August 5, the results of the poll in the magazine Uncut. That poll was to find the one hundred songs, movies, television shows and books that "changed the world" in the opinion of musicians, actors and industry experts. (This was the magazine's one hundredth issue after all.) Readers in the UK can check out the results in detail in hard copy - the magazine doesn't provide the results online. Online there's only notes on what didn't make the cut, so to speak. So we here in the States must take Reuters' word for the winners. Bob Dylan's "Like a Rolling Stone" (1965) won - of all the songs and movies and books and whatnot, this most "changed the world," if one is to believe the likes of Paul McCartney, Noel Gallagher, Robert Downey Jr, Keith Richards and Lou Reed. Oh yeah, add Edward Norton and ex-Beach Boy Brian Wilson. Elvis Presley's "Heartbreak Hotel" was in second place. Patti Smith on the Dylan song: "I absolutely remember where I was when I first heard it. It got me through adolescence." Really? She might have made it anyway, with or without Dylan. Paul McCartney, who voted for "Heartbreak Hotel" explains why: "It's the way (Presley) sings it as if he is singing from the depths of hell. His phrasing, use of echo, it's all so beautiful. Musically, it's perfect." So Sir Paul is being technical, not personal. Third place? The Beatles' "She Loves You." Fourth place? The Rolling Stones' "(I Can't Get No) Satisfaction." Fifth? The highest-ranking film - Stanley Kubrick's "A Clockwork Orange." Sixth were "The Godfather" and "The Godfather II" films. Television was not represented until you got to the tenth slot, and there you'd find "The Prisoner" (1967) - as close as television comes to Kafka, at least intentionally. If you don't know the show see this. What about books? The first one shows up at number nineteen in the poll - Jack Kerouac's "On the Road." Whatever. At the heart of this is the idea that songs, movies, television shows and books do, in fact, change the world. Perhaps they do, but asking musicians, actors and industry dudes may have not been the best idea. Should have asked George Bush, or the new pope, or Tony Blair, or Nelson Mandela. Of course Uncut is not that sort of magazine, but it would have been interesting.